I received lots of requests for a Chewy Sesame Peanut Candy (Keo Me Dau Phong) recipe after sharing the brittle version not too long ago. 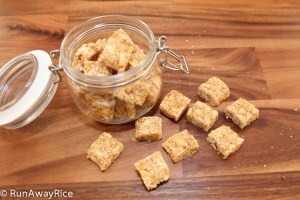 (Check out the link for my Peanut Candy (Keo Dau Phong) recipe.) This wonderful confection, as the name indicates, is softer, chewy and more like a nougat. 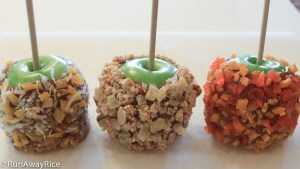 It’s perfect for those who don’t like hard candy or fear cracking a tooth on these sugary delights. 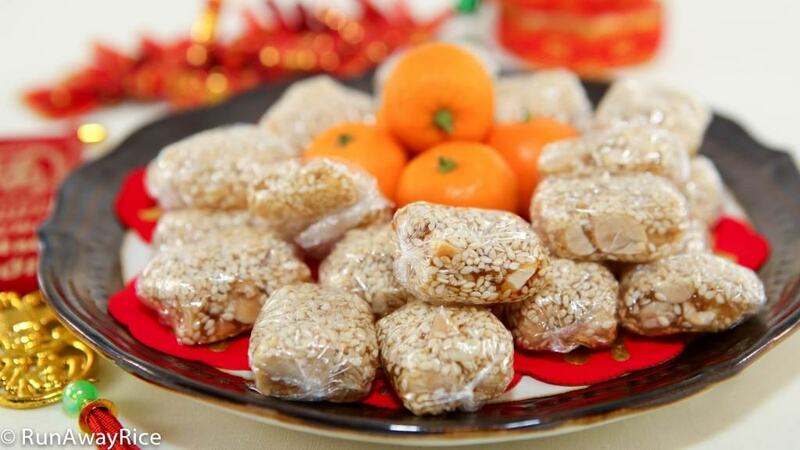 The Viet version of this candy, Sesame Candy (Keo Me Xung), is made with only sesame seeds. 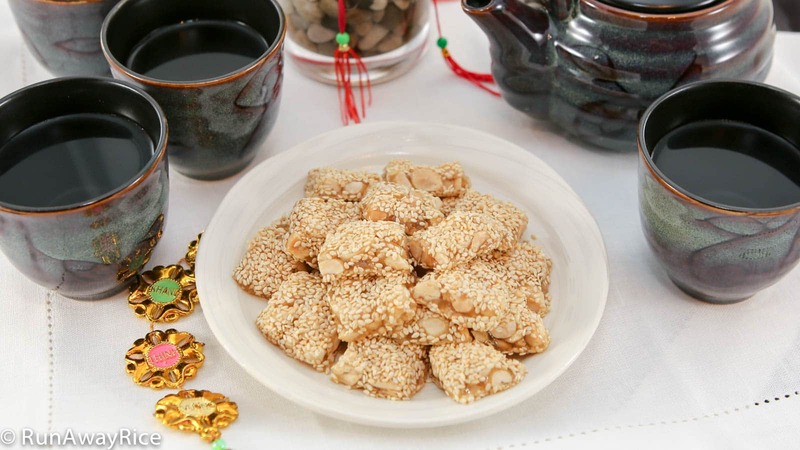 I love the coupling of sesame seeds and peanuts and modified the traditional recipe. If you’d like to make an all sesame seeds version, just substitute the peanuts for more sesame seeds. The rest of the recipe is the same. Feel free to also use any combination of nuts you like. Enjoy! Be attentive as the syrup nears the 5 minute cooking window as it turns dark very quickly from this point on and can burn quite easily. As soon as the syrup reaches the golden, honey color, add the lemon juice right away. 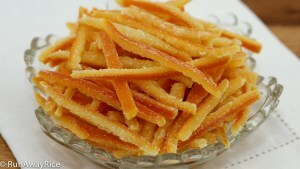 The lemon juice helps to suspend the syrup in its current candy state. Add the lemon juice quickly and be careful as the syrup may splatter. Stir the tapioca and water mixture before adding to the syrup as the contents tend to settle. Again, as with the lemon juice, pour the mixture quickly into the pan and then stir vigorously. The tapioca starch turns from opaque to translucent when it’s cooked. For faster cooling, place the candy in the refrigerator for 2 hours. Add the tapioca starch to 1/3 cup water and stir until mixture is smooth. Set aside for now. Line a 9×6 inch pan with parchment paper. Drizzle vegetable oil into the pan and then use a brush to coat the paper with the oil. Sprinkle 1/4 cup sesame seeds into the pan. Tilt and gently shake the pan to distribute the sesame seeds making sure to cover the bottom of the pan completely. As soon as the syrup starts to boil, stop stirring. Cook the syrup for 5 minutes or until it thickens and turns a light honey color. Reduce the heat to Low and cook for another 1 minute or until the syrup turns a honey color. (Be careful with this step as the sugar cooks very quickly at this point and can get dark and burn if left too long.) As soon as the honey color is reached, quickly add the lemon juice and stir together. Stir the tapioca and water mixture and then pour into the syrup along with the vanilla extract. Stir quickly to combine and cook for another 1 minute. Add the peanuts and mix well with the syrup. Cook for another 1 minute and then turn off the heat. Pour the hot candy into the pan prepared earlier and spread evenly into the pan. Sprinkle the remaining 1/4 cup sesame seeds on top. Use a spatula or the back of a spoon to smooth out the top. Allow to cool for 3-4 hours. To serve, remove the candy from the pan, peel away the paper from the edges, cut off the edges (optional) and then cut into 1 by 1 inch squares. Store any uneaten candy in an air-tight container. The candy is good for up to 2 weeks. This candy is a really popular sweet treat for Lunar New Year and you can easily make little goody bags or boxes for gift-giving. Individually wrap the candies using plastic wrap or parchment paper to make tasty little bon-bons. Alternatively, use small cookie cutters to cut the candy into fun shapes and then place on mini cupcake liners for cute little treats. As Lunar New Year often falls close to Valentine’s Day, I decided to turn these candies into little V-Day treats. Can you use Mochiko instead? I haven’t tried using Mochiko but it’s worth a try I just made a batch of candy yesterday. Next batch I’ll try it too. Good Luck! I can’t wait to make this. My all-time favorite Chinese restaurant in Massachusetts on the Natick/Wellesley line was Chin’s Village and they served the soft sesame candy along with pineapple chunks after dinner. I loved the candy and have not seen it served, nor sold anywhere since. And the restaurant burned down long ago.,…. 🙁 This was all very long ago in the 60’s, 70’s and 80’s. I would love to eat there, just one more time. Thank you. I used corn starch and only half the amount of sugar, but it came out perfect! That’s wonderful Yasmin. I am so happy to hear that. Enjoy! It’s the same. Enjoy the recipe! Hi Trang! Thanks for the recipe. Is there a way to cut down on the sugar for those watching their sugar intake, yet still have the recipe turn out with the right thickness? I haven’t compared the sugar content but you can use corn syrup, maltose, honey or agave syrup. These alternatives yield a similar consistency to sugar when cooked. It’s amazing! We love it! Thank you Trang. Chi Trang oi, I hate to bother you but I figure by asking questions, maybe others can learn from my mistake. I attempted the peanut candy for the first time today. The melted sugar scared me to no end but it turned out quite decent for a first timer. Did you by any chance double the recipe in your video? If you did, what size pan did you use? My candy is on the thin side, not as thick as yours but yummy though. Thank you for sharing the recipe. 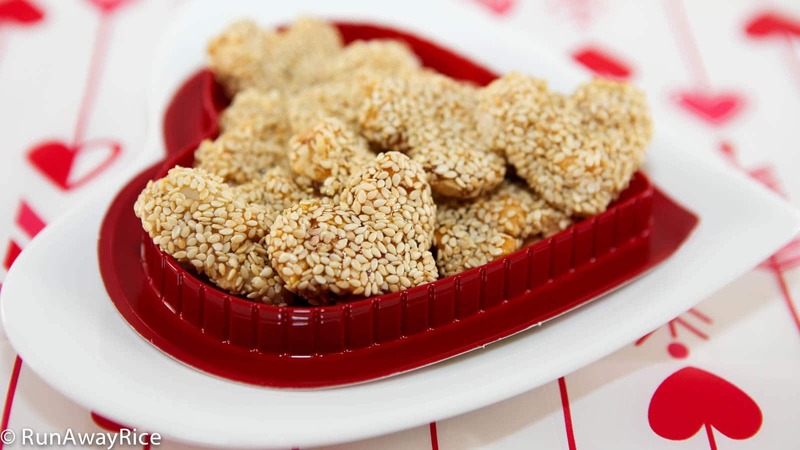 By the way, I will do this chewy peanut candy for lunar new year 2015. Wishing you good health and happiness!! Happy Lunar New Year 2015!!! !